Want to drive the top sports car in the country? You may be surprised at how affordable it can be. The new 2019 Mazda MX-5 Miata has been ranked number one by US News & World Report. It’s also ranked number one in convertibles. The new design has been praised for its lightweight agility that achieves great acceleration and power without the horsepower of a luxury sports car. 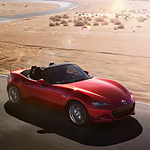 The Mazda MX-5 Miata can accelerate up to 181 horsepower, which is up from the previous design. The previous models were only able to get 150 horsepower. There are other design changes you’ll recognize in the latest look of the Mazda MX-5 Miata, including the head lamps, grill, and sleek aerodynamic trim. Everything is small in this sports car, so you should expect to enjoy it for its speedy, nimble handling and not for its cargo space or extreme horsepower. If you want an affordable sports car with a beautiful exterior and interior, this is the sports car for you. You can feel the power of the Mazda MX-5 Miata when you take a test drive. Want to schedule one? You can go online and visit Putnam Mazda located in Burlingame.